Everyone is going absolutely crazy for Pokemon Go. If you have no idea what this is, then where have you been hiding? This game, as simple as it is, has been motivating people to get up and go outside all over the country (world!) since it launched earlier this week, and is taking the internet by storm. 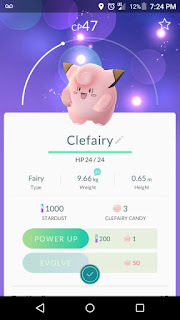 Basically, you download the app (for free), install it to your phone, turn on your location services and then walk about aimlessly looking for Pokemon on the streets around where you live, work and visit in the quest to find Pokemon, which you can even view on your screen as if they were present in the real world, via your camera for some great hash-tagged moments on social media. I had absolutely no intention of downloading this app but, in the interest of keeping up with friends in certain Facebook groups, I did and now I am hooked! 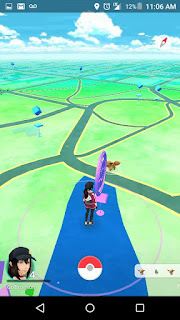 What makes it worse is that there is a HUGE park right near us, which seems to have a lot of Pokemon hot spots - plus we live in the city and so there are stops on just about every street corner, too. 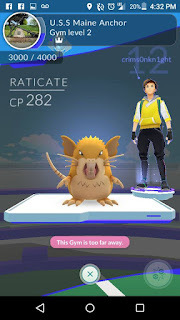 I am usually out and about, regardless of this app, but the amount of people I have seen out walking this past few days has definitely increased - there is a Pokemon Gym a stones throw from my house and so there have been people sitting there on and off all day, but I am just a few inches too far away from it in my house to do much with it from inside - noooo! The fun of the game has everyone in town walking about like zombies, staring at their phones in the usual manner, but sometimes those stares are now accompanied by high-fives and gasps as they find Pokemon and get one-up on their fellow explorers! I think it is great to see so many people getting in some walking, which can be great exercise, but I am fearful for the muscles in their necks - plus the probability of walking into a post/door/wall etc has surely increased ten-fold, especially for people like me who are accident prone, s stay safe and pay attention if you do decide to play. I can't help but love this game. Everyone is playing it and it is competitive in the nicest of ways. The kids seems to enjoy walking around and enjoying the sun and harvesting Pokemon all over the place, which keeps conversation going, too. Just a fun, fit and family-friendly way to spend a nice and sunny day! Have fun out there, you guys - Gotta Catch 'Em All!